Ridley Scott’s ‘Prometheus’ is visually enthralling for the most part, however as the film shifts gears, it loses its purpose and pulls you in to a state of predicament. You will spend most of your time wondering whether it’s a sequel or prequel. Eventually, by the end of the film, I doubt if you’d be able to figure it out because the film is so complex yet brilliant in a way. 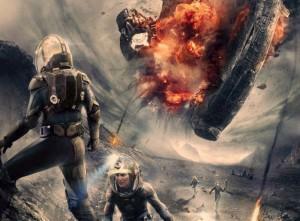 ‘Prometheus’ would’ve been better off had it been some kind of psychological game than a movie. includes a pair of scientists – Noomi Rapace and Logan Marshall-Green; the discoverers of the expedition, Charlize Theron as the monitor, Idris Elba as the ship captain and Michael Fassbender as an android. Upon reaching they discover the evidence to the presence of something ungodly. As the crew members begin to decipher the clues, conflict arises between the members making way to unspeakable consequences. What is the purpose of each of the crew member with what they’ve discovered forms the rest of the story? This Scott film in particular requires lot of attention and patience to actually understand. It doesn’t mean that film is bad or pathetic; it just requires most of your attention to help you understand its purpose. Nicely wrapped in darkest whims, the story creates layers of deceit, trying to explain why there is a relentless urge to play a super power, which by the way is hard to understand. The film produces many thought provoking moments, so many, that at one point everything becomes awry. 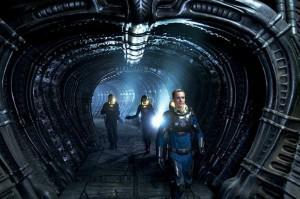 From what I understand, ‘Prometheus’ turns out be the prequel to the original film, but in no way directly connected, explaining along the way the inception of Weyland Corporation and killer aliens, and why they exist at the first place. The 3D experience leaves you in awe with some breathtaking visual sequences that is no match any film of the recent past. On the contrary, the long running time drains the life out of you and pushes you in to oblivion. This mega budget flick is definitely watchable for its visual grandeur and earth shattering score by Marc Streitenfeld. Noomi Rapace, after a brilliant performance in ‘Girl with a Dragon Tattoo’ portrayed Elizabeth Shaw with exuberance and elegance. Although, others too did a satisfying job of portraying their roles with immense potential, Noomi stole the limelight undoubtedly. 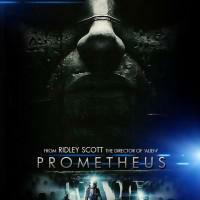 If you’re planning to watch ‘Prometheus’ then may I suggest you leave the thinking for afterward and watch the movie with utmost attention because it needs it.